Preheat oven to 350 degrees. Combine cookie crumbs, butter and sugar. 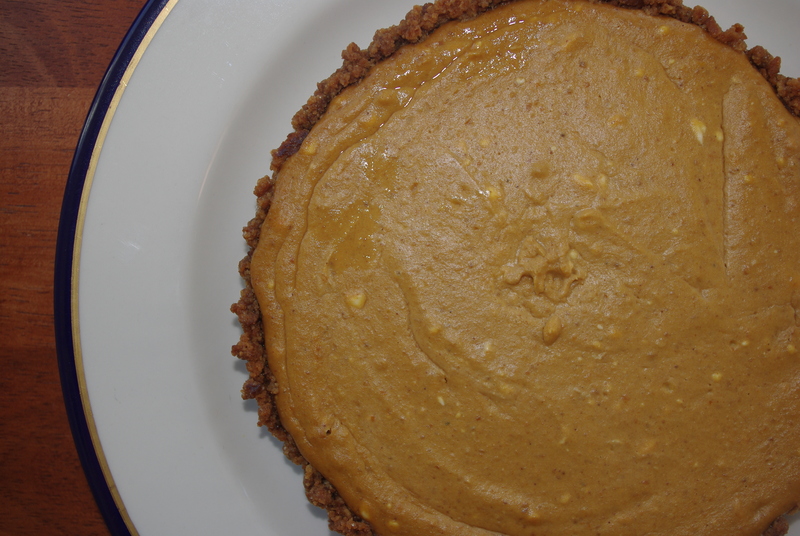 Spread in an 8-inch tart pan with removable bottom. Bake 8-10 minutes or until the crust is set and crisp. Lower oven to 325 degrees. With an electric mixer, combine cheese, brown sugar, spices, grated ginger and salt. Beat until creamy. Add pumpkin and beat until smooth. Beat in the egg until just mixed. Pour filling into the baked crust and smooth the top. Bake 35-40 minutes or until the center is set. Cool to room temperature then cover and refrigerate for at least two hours or overnight.